The financial and economic crisis of 2008 has left a continuing legacy on social welfare, showing up in slow economic growth, unemployment and underemployment, and increasing social conflict. In the debate over the future of the world economy, many foresee a long depression, and the intensification of neoliberal austerity. Geoffrey McCormack and Thom Workman’s new book is concerned with Canada’s unique economic and social history over the period of neoliberalism, including the financial and economic crisis of 2008. 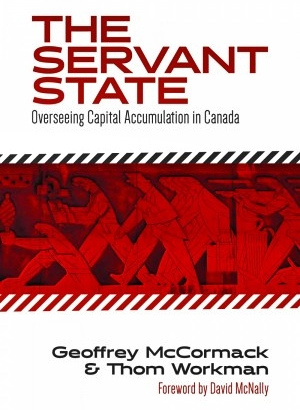 In The Servant State: Overseeing Capital Accumulation in Canada (Fernwood 2015), McCormack and Workman present a classical Marxist perspective, and intervene into a range of theoretical and empirical debates on the course of the Canadian economy over this period. Many of the accounts on the crisis focus on: (1) the character of the crisis in Canada given an over-reliance on “super-cycles” related to resource exports, now worsened by the collapse of oil prices; and (2) how the crisis originated in the particularities of predatory financial capitalists and the expansion of credit in Canada. McCormack and Workman argue that capitalists in Canada had been enjoying relatively strong rates of corporate profitability since the early 1990s, leading up to 2005. Investment up to 2008 was also strong. These two things together produced both a healthy financial sector and a healthy industrial sector while in the U.S, Western Europe, and elsewhere saw declining output, layoffs of workers, and financial instability. They conclude that economic policy in Canada cannot be credited for Canada’s economic durability since 2008. McCormack and Workman advance an analytical framework building on themes found in Marx’s Capital . In it, understanding the “laws of motion of capital” that govern the evolution of capitalism is key to understanding Canada’s economic history. These laws provide a foundation for a theoretical explanation as to why there is a tendency for capitalist economies to have recurring major crises, if each still has its particularities in their formation and the form their resolutions takes is not easily predicted. These are a result of social struggles. In terms of political implications, they argue that the continuing austerity measures that have been pursued in Canada since 2012 are a return to past economic policy, in which Canada attempted to position itself as a low-cost, low-debt production zone within North America. The interests of the capitalist class have held a position of priority in the governance of economic policy and the economic system. 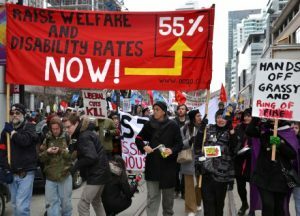 Even the social and economic policies originating in the post-World War II period associated with the welfare state were in fact far less generous toward the Canadian working class. The various phases of neoliberal austerity express as much continuity as a break with Canada’s past. Geoffrey McCormack is an Assistant Professor of Political Science and Global studies at Wheelock College in Boston, Massachusetts, USA. He specializes in the history of political economy and theories of contemporary capitalism. He is completing a second book that explores Canadian economic history over the last five decades, and is designing a large study of contemporary global capitalism. Thom Workman is a Professor of Political Science in the Department of Political Science at the University of New Brunswick. His research explores post-Enlightenment era philosophical and sociological critiques of modernity. He is the author of several books, including If You’re in My Way, I’m Walking: The Assault on Working People Since 1970 (Fernwood 2010). Robin Chang is in the Department of Political Science at York University, where he studies Marxian political economy and is writing his dissertation on the political economy of health and healthcare in Canada and the United States. Robin Chang (RC): Why did you write this book? What political background led you to it? What major concerns guided how you framed your approach to the economic and social history of Canada? Geoff McCormack (GM)/Thom Workman (TW): We had become convinced that there was a gap in the commentary on Canada through the Great Recession. A lot of it was descriptive and tended to adopt a rhetorical language in reporting the crisis, and especially with respect to the struggles of the working class. We refer to this standpoint as one of indignation – the quality of being appalled at the depravities of the ruling elite and the obscene character of our contemporary capitalist world. We share this indignation – and are especially appalled by the misery and hardship that has befallen the working class in Canada – but we hasten to add that proper commentary must centre an analysis of capitalism directly. This analysis must include a theory of its laws of motion as well as a theory of the obliging character of the capitalist state. Aside from providing insight into the depravities themselves, this analytic strategy also helps expose the irredeemable nature of capitalism and helps to maintain a political orientation stressing the need to get beyond capitalist social relations of exploitation and abuse. profitability was not a factor in the crisis. You, like others, say the falling rate of profit is central to the causes. Why do you think this is the case? sense that underlying structural factors have deteriorated over the long haul. We believe that a proper theoretical account of the crisis period ought to include both the outward phenomenal forms and the essential relations that endure across capitalist history. RC: How do you think that the relationship between the condition of financial markets and the rest of the economy, in particular the mechanisms motivating investment, can and should be understood? GM/TW: We adopt the classical perspective that investment in fixed and circulating capital is fundamentally profit-led. In other words, businesses invest to make money. Typically political economists are concerned with the determinants of capital accumulation. In other words, we want to know when investment in additional machinery and equipment occurs. The short answer is that if capitalists think they can make a profit on those new investments, they will invest. If they don’t think they’ll make any money, they won’t invest. This approach to the question of investment is distinct from those that tend to see investment as a function of the rate of profit in a direct sense (that is, the rate of return on total investments). For us, as for thinkers like Henryk Grossman and Anwar Shaikh, the key is the rate of return on the latest investments. This idea finds parallels in other schools of thought as well. For example, Keynes calls it the “marginal efficiency of capital.” To reiterate, we don’t look principally to the rate of return on total investment; rather, when it comes to capital accumulation, we look to the rate of return on the latest investments. Investors scour the markets for the most profitable places to invest. Sometimes rates of return will be higher in stocks or bonds, and money will flow into financial markets. Sometimes returns will be higher in investing in additional machinery and equipment, and thus firms will invest in expanding capacity. The point is that all of these decisions occur at the “frontier.” As a result, money courses ceaselessly from opportunity to opportunity, constantly in search of the best rate of return. This restlessness gives capitalism its dynamism and plays an important role in reproducing the system. This is more or less Adam Smith’s “invisible hand.” That being said, it is also a turbulent and crisis-ridden process in which financial speculation is ever present and bubbles easily emerge – especially if the underlying conditions for profitability have eroded, an important tendency in capitalism. RC: Why did you title the book “Servant State”? What does this say about how you situate the capitalist state in your theory of capitalism, in particular, its “relative autonomy”? What was the role of fiscal and monetary policy in the shape of the Canadian crisis? GM/TW: We view the state as that set of institutions that has emerged over time to optimize the conditions for capital accumulation and to manage the class struggle. There are certain parameters beyond which state policies and institutional configurations are unlikely to pass in capitalism. These parameters optimize the conditions for capital accumulation and they have come to persist into the contemporary period. For example, the capitalist state is unlikely to create policies that undermine the coercive integrity of the labour market. Put differently, the state provides an institutional and policy framework within which capital accumulation can occur. At this relatively abstract level of analysis, the range of possible policies and institutional configurations is quite broad. We can concretize the analysis further by suggesting that these parameters are dynamic. In other words, the range of policy and institutional possibilities changes across periods. For example, the postwar period of growing profits and rising wages allowed for a “Golden Age” industrial relations regime with a large welfare state. However, the underlying conditions for profitability and capital accumulation slowly began to deteriorate in the late 1940s and reached critical levels in the early 1970s. The long period of stability founded upon profit growth and capital accumulation gave way to stagflation and instability. The conditions that made the postwar industrial-relations regime possible eroded (profitability and thus capital accumulation). Capital accumulation is profit-led; so solutions to this crisis revolved around restoring corporate profitability. The neoliberal boom in the U.S. was largely premised upon restructuring and repurposing the postwar industrial relations regime to force workers to work harder, longer, and for less pay. The postwar industrial relations regime gave way to the neoliberal regime. But neither policy regime in any way overstepped the need to preserve the coercive integrity of capitalist labour markets. It is for this reason that we are more inclined to emphasize the continuity of Canadian state policy in the postwar era, an emphasis that sternly qualifies our assessment of the recent age of austerity through the Great Recession. RC: You find that a number of perceived deficiencies of contemporary work in Canadian political economy (CPE) stem from an improper grasp of Marx’s theory of value, and stress that there are theoretical alternatives. How would you characterize CPE? GM/TW: In our assessment, there are basically two CPE traditions. The first one is centred on the staples tradition; and the second on classes, class fractions, and class struggles. Both traditions help to illuminate the Canadian experience. However, both fail to centre the analysis of capitalism’s laws of motion and fail to adopt an adequately suspecting theory of the capitalist state. It is here where we’d like to think that our study makes a contribution to the sprawling literature. To elaborate, we insist on emphasizing the distinction between class analysis, on the one hand, and Marxian analysis, on the other. Marxian analysis is not reducible to class analysis. It gives us much more. Marx gives us the analytical framework to understand the processes that lie behind the contours and intensity of the class struggle in any given epoch. In general, business leaders will do what they can to reduce wages. For those on the left, broadly speaking, this is perfectly obvious. This is what labour-market flexibility and the restructuring of EI (employment insurance) benefits is about. They are about forcing workers to take crappier jobs at lower pay. At this level, however, the distributional struggle is entirely decipherable by means of class analysis. You do not need to read Capital to understand that business owners try to drive down wages. That being said, Capital is Marx’s principle scientific contribution to understanding capitalism. We believe that Marxian political economy at its best integrates the insights of Capital into analyses of modern-day capitalism. We do not believe that Marxian analysis proper is ambivalent toward the social relations of value. The difference between class analysis and Marxian analysis is an important division within all scholarly traditions of political economy, including the CPE tradition in Canada. RC: Radical political economists seem to have conflicting interpretations of the meaning of “law” in political economic explanation. For some, identification of laws and their application is necessary because a sufficient definition of the capitalist mode of production depends on questions of the theory of value, which involves a theoretical understanding of the origins of the surplus, how the commodity form is reproduced and expanded, and why capitalism has crisis tendencies emanating from this social foundation. Some take this effort to amount to a kind of sophisticated but nevertheless economic determinism. But, still others argue that the notion of stages of capitalism is part of the classical Marxist project, and therefore merging what Ernest Mandel problematized as “theory and history” is not only possible but an imperative in order for one’s political economy to be concrete enough to be politically informative. What do you mean by law, and in general terms, what is the role of the law of value and motion of capital in the historical development of capitalism? GM/TW: We have always found it ironic that Lukács defines orthodox Marxism in terms of its unique methodology – particularly since a survey of Marxism reveals different analytical methods within the tradition. Our particular method, we hope, embraces the kind of science that Marx was doing, especially in works like Capital , Theories of Surplus Value , and the Grundrisse . But we know that this analytic approach is not the regnant scientific paradigm at the moment. Things like “causation” and “lawfulness” can actually have quite different meanings depending upon the scientific paradigm being employed, but this tends not to be recognized within the Marxist tradition. We would be inclined to label our approach as an organic essentialist analysis with a corresponding generative phenomenology (hardly anything new here to be sure!). tendency for the rate of profit to fall. This does not mean that every event or crisis in capitalism is directly precipitated or caused by the social relations of value. Rather, it merely means that the underlying structural conditions of capital accumulation are abiding and persistently contour the unfolding phenomena in capitalist societies – including especially its crises. While it is true to say that each crisis in capitalism is unique insofar as a series of intervening factors coalesce to create a distinctive crisis profile, we would emphatically assert that no institution, class or social force in capitalist history should be analyzed apart from the unfurling social relations of value. Bluntly, if analysts fixate on the contingent or idiosyncratic elements contributing to crises we risk losing sight of the necessary relationship between capitalism and crisis, and therewith we risk losing sight of the politically irredeemable nature of capitalism in and of itself. To give this point a bit more political oomph, our analysis is not aimed at crisis attenuation or avoidance per se, but is rather aimed at underscoring the fact that crises are an inescapable part of capitalist life irrespective of the heteronomous factors that precipitate them at any point in history. Our steadfast political opposition to capitalism becomes all the more uncompromising because of capitalism’s immanent tendencies toward crisis. An understanding of capitalism’s crisis tendencies is enough to remind us that the for-profit system of socialized production accompanied by private appropriation is politically irretrievable. RC: You adopt social structures of accumulation concepts and themes from radical political economy in order to develop your Marxist analysis of Canadian neoliberalism. The role of what David Kotz calls the “form of capitalism” in the expression of crisis tendencies in capitalism is to this school of thought the key explanatory goal. But, this school has been accused of holding to a theory whose causal relations across levels of analysis are not always clear. How do you understand the relationship between the form of capitalism and the expression of crisis tendencies should be understood in the case of neoliberalism? GM/TW: Although we occasionally use the language of the SSA school [American-centred social structures of accumulation], we feel that the weakness of this literature centres on its failure to present a systematic or coherent theory of capitalism. As such, it inclines to overdraw the uniqueness of the institutional configuration to the neglect of the endogenous laws of motion. We share with this school an emphasis on the importance of class struggle and the manner in which this struggle contours and frames institutional configurations in any given conjuncture. The Wagnerian labour regime is the obvious one that springs to mind in the 20th century, to say nothing of the programs associated with the welfare state. That being said, the underlying conditions of profitability and the unswerving fidelity of capitalist institutions to the accumulation project writ large trump the specificities of any particular institutional configuration. Class struggle matters, but its importance must be balanced against the imperatives of capital accumulation, the immanent tendencies toward crisis in all capitalist social formations, and the need to preserve the coercive integrity of labour markets. Plutocratic greed abounds, but it matters far less than we often suppose. The fundamental point of our book is that these dynamics apply to Canada and help to explain both its similarities with other capitalist social formations through the Great Recession as well as the uniqueness of the Canadian experience, particularly the fact that it tended to weather the recession better than its counterparts. RC: In the book, you discuss classical Greek and Modern democratic theory, in addition to classical political economy. What is the importance of the themes of political theory for analyzing contemporary political economy, and this particular political moment of what some have called an era of post-democracy? GM/TW: Under the absolute best of circumstances – in theory we might say – a democratically elected government cannot contain the crisis-ridden nature of capitalism. The most progressive social policies and the most enlightened and progressive ruling elite will be forced to respond to the crises that inevitably emerge over time; and even as it deals with chronic problems such as unemployment and poverty, it will be forced to respect the coercive integrity of capitalist societies. The constellation of political power wedded to the accumulation project will not permit otherwise. Popular democratic control cannot be squared with the hierarchical nature of the class structure, both inside and outside the workplace. Even under ideal situations, therefore, capitalism and democracy will be an awkward fit. The recent Greek experience provides one of the most sobering examples of this stunning degree of manipulation and control in the face of popular push-back. And even when such political control momentarily gets away from the plutocratic elites, as in the case of the U.S. primaries at the moment, the mechanisms to insure compliance remain formidable. The ability of the elites in Canada to contain popular democracy is perhaps one of the most stunning features of the Canadian political system, especially as exercised through party control, a servile media that stupefies, mass cultural distractions, the myths of Canadiana and so forth. Canadian political life certainly bears little resemblance to the Spanish or Greek experience where resistance to capitalist austerity has been most acute. We are nowhere near the manifest struggles for popular democratic political control that we have recently seen in the United States where the disaffected working class has split along GOP and Democratic lines and expressed its frustration through the primary process (to the consternation, chagrin and dismay of party elites on both sides, of course). But they’ll wrestle back total control sure enough. RC: The book acknowledges that the socialist vision of radical social transformation is not alive and well. Nevertheless, you are optimistic. How would you characterize relationship to the NDP and electoral politics in general? What political movements and other forms that may have radical potential do you see emerging from contemporary capitalism? would you know this by the narrowness of political discourse in Canada. So much struggle in Canada and around the world rejects capitalism in whole or, at least, significant parts of it, but this spirit of repudiation finds little expression in mainstream political arenas. To highlight this political gap we could point out that path-breaking Marxist contributions from the past, including those from commentators like Lukács, Korsch and Gramsci, responding as they were to the politically impoverished formulations of the Second International, invaluably argued that politics – or “the political” as we might say – does not simply “read off” the economic or productive crises endemic to capitalism. Their interventions and those that followed taught everyone on the left an invaluable lesson that resonates down to today. Politics and political struggles matter, and these struggles have to be deliberate and foresightful. These interventions, however, never suggested that we lose sight of the basic truths about the irretrievable nature of capitalism. Yet, this is what has happened on the mainstream left! It has more or less lost sight of “the capitalism question,” both in terms of its enduring class warfare and in terms of the crises endemic to it. Regarding class struggle, the shibboleth of the middle class dominates – a populist colloquialism that resonates with both the illusory promises of capitalism and petty nationalist sentiments. Neither the NDP nor the Green offers the kind of leadership we think is necessary in an age when political discourse has slipped into a miserable decline. Social democracy in Canada has reached an electoral lustral with both capital and capitalism. Recent NDP leadership shifted even further to the right. In the last election, they campaigned on a “balanced budget” plan and were humiliated when they were outmaneuvered by the Liberal Party, a party with a long history of campaigning “red” and governing “blue”! This is all terribly disappointing. pro-capitalist view despite its frightening metabolic rift with the natural world. There is, of course, much more to the left picture. The mainstream left sees capitalism as a workable framework, but the more radical left is convinced that capitalism has to go. This is why we say there really are two lefts in Canada. To us, the conventional left underestimates the general contempt for capitalism evident everywhere. And so the sensible admonition that the left must take the richness and ambiguity of “the political sphere” seriously has morphed into the idea that politics can largely ignore many of the more enduring horrors necessarily associated with capitalist accumulation and imperialist plunder. The NDP in particular has become an interest-aggregating party in the classic sense of this label, and the utter failure of the Greens to premise their agenda on a penetrating understanding of capitalism provides a sobering foil for all radical socialists. Our optimism obviously has nothing to do with the prospects of either the NDP or the Greens. The more radical left takes its cue partly from the orthodox Marxist tradition that explores capitalism’s immanent tendencies toward crisis, the sort of analysis that Marx began with his mature political economy, especially Capital. It this sense, this means moving well beyond “class lines” on assorted political issues – the sort of things we see in the U.S. with Bernie Sanders. To repeat, you do not need to study Capital or engage in Marxist reveries to understand that stingy business owners try to drive down wages or that working class families have slipped into decline. Geoffrey McCormack is an Assistant Professor of Political Science and Global studies at Wheelock College in Boston, Massachusetts, USA.